It's that time again! 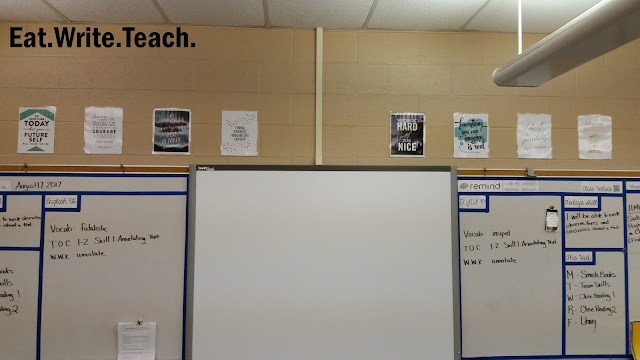 I'd like to share a look into my classroom in the hopes that it might inspire. 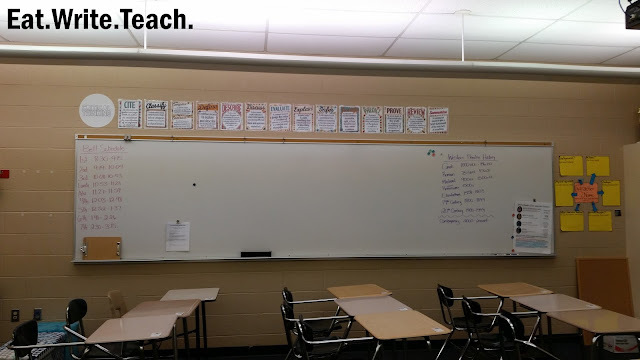 We've already been in school two weeks, so the room isn't as pristine as it was the first day of school. 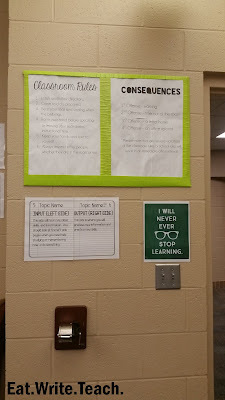 I guess you get to see my classroom as the mostly-functional space it is meant to be. Want to see how my classroom has evolved over the years? 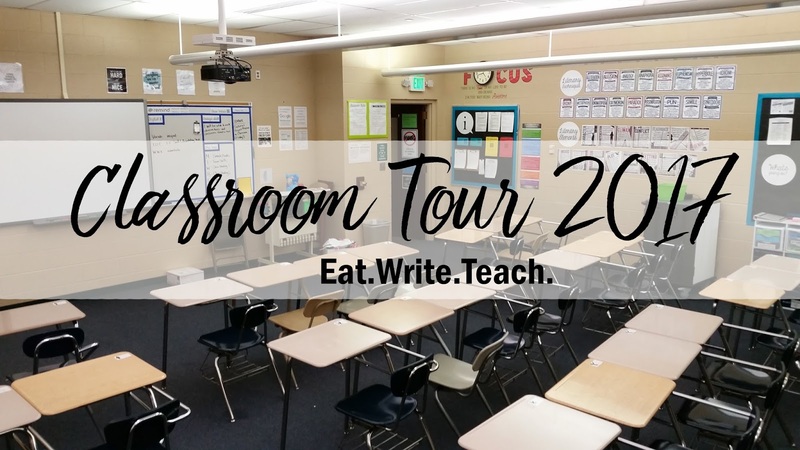 You can check out my previous classroom tours by clicking the links below. 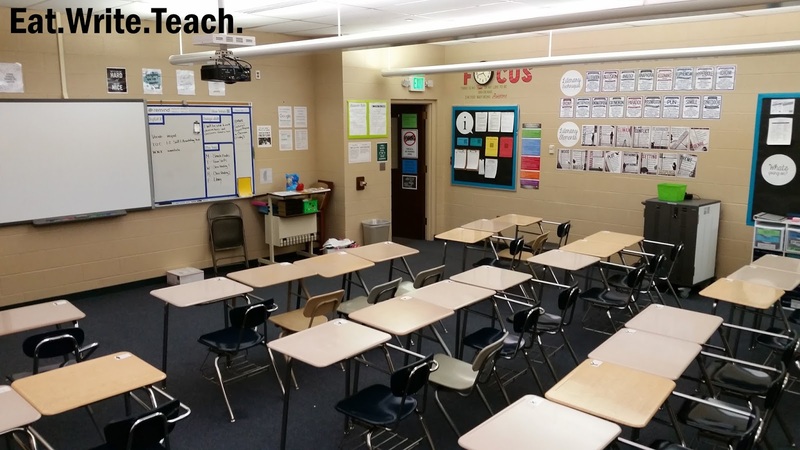 I thought I'd start by standing on a desk and giving you a look at the room from up high. Notice that my desks are definitely not as tidy as I would like, but that's okay. My largest class has 32 students in it, so that's how many desks I have squeezed into this space. 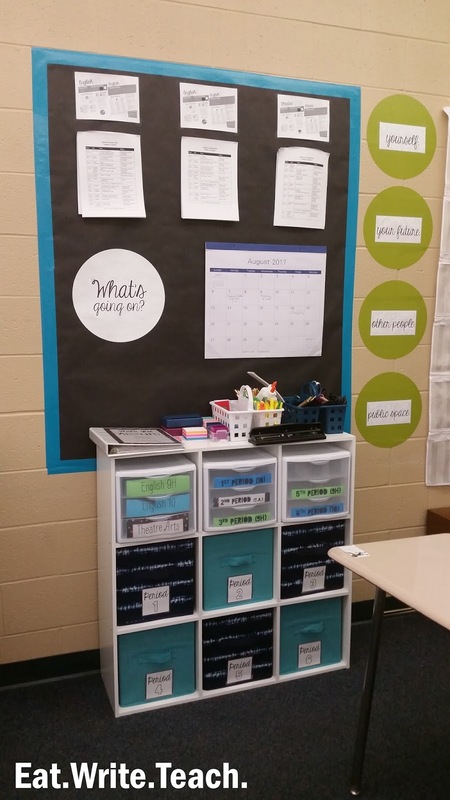 I kept the same set up as last year, but instead of having 3 rows, each with 4 sections of 2, 3, 3, and 2, I now have 3 rows with 3 sections of 3, 4, and 3 (with 2 desks in the back on their own). 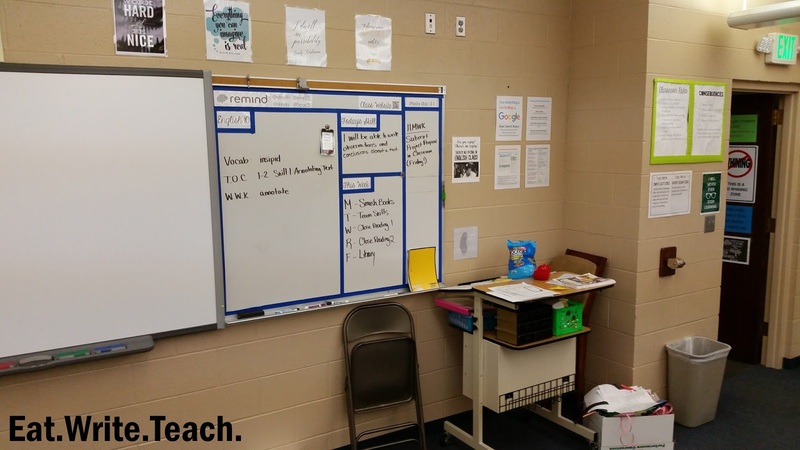 I like this desk arrangement because it is easy to move between rows, all students can see the board, and I can stand behind them and see all of their Chromebook screens. 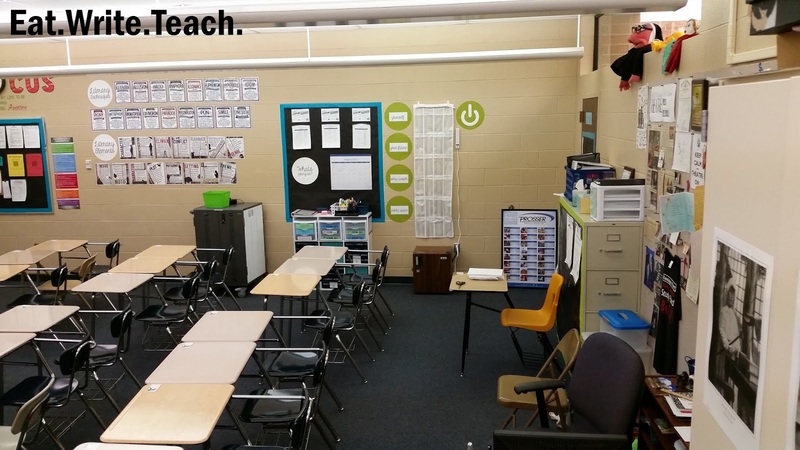 Starting over by the classroom door, I have my standing desk (which I love, but it's a total mess right now). Above the standing desk is a new set of mini-posters I created on how to do a Google search. 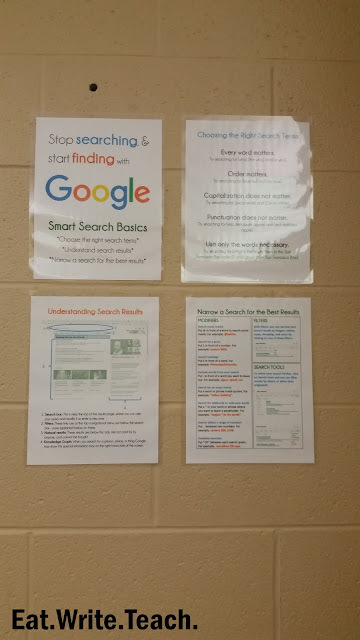 In includes some of the information I learned during my Google training this summer. 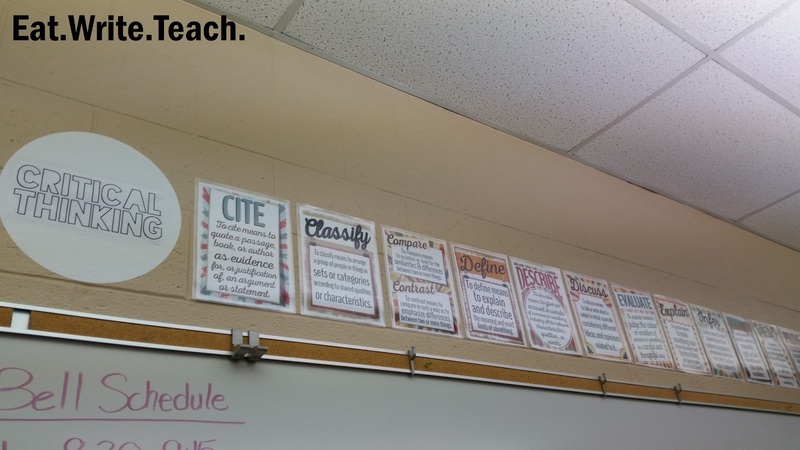 I revamped my information bulletin board this year to give it a cleaner look. 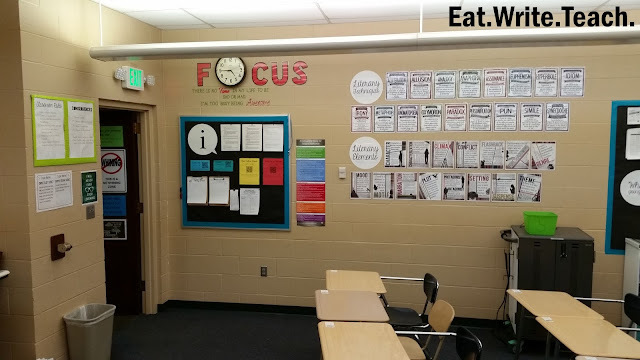 I also did the FOCUS thing with my clock that I saw in about five different Pins. I love it, even if the clock is a little bit big for the font. 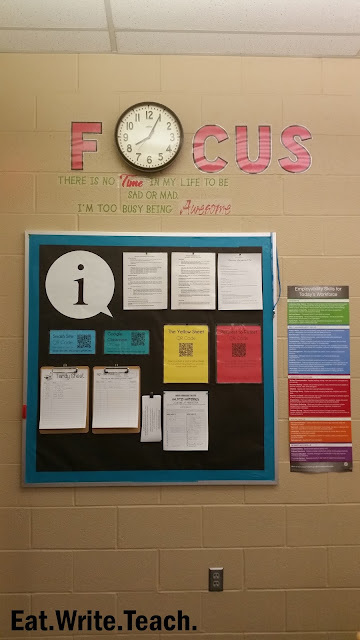 I added QR codes for my classroom website and Google Classroom this year, in addition to the QR codes for the Yellow Sheet and the Request to Retest form. I have a tardy clipboard and a sign-out clipboard on there too, along with school policies and audition sign-ups for my theatre kids. Aren't these beautiful?? AHH I love them so much! These are Stacey Lloyd posters, purchased during the annual Teachers Pay Teachers Back-to-School sale. I printed them and laminated them before putting them on the wall. The white circles are Wallpops. I am thrilled with how this wall turned out, and it is already becoming a handy reference area. I added another area of organization for my classroom. 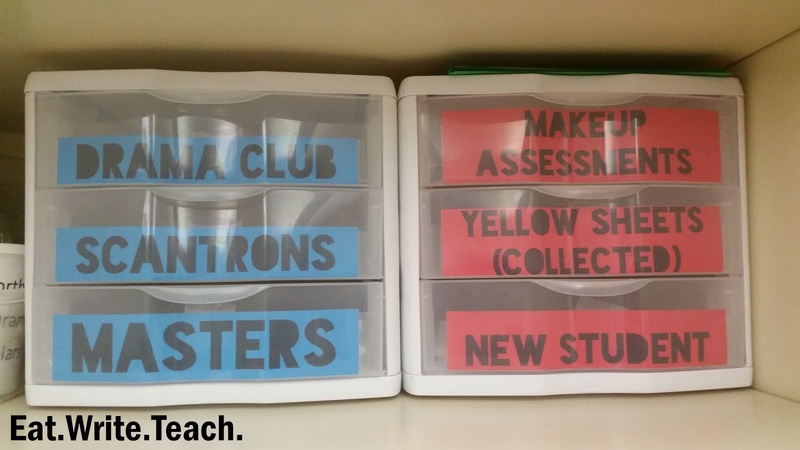 This is my student supplies center. 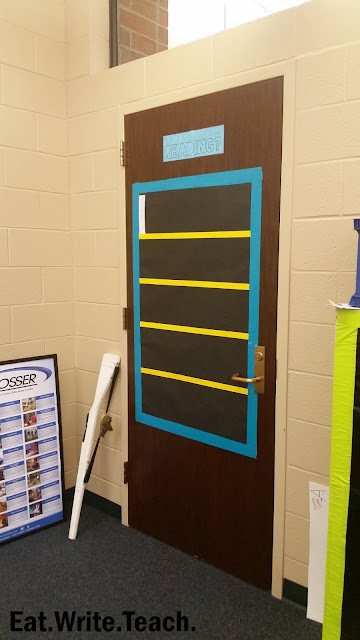 I made a paper bulletin board, which features the syllabus and pacing guide for each of my three preps, and I hung a desk calendar on the wall to note special events. 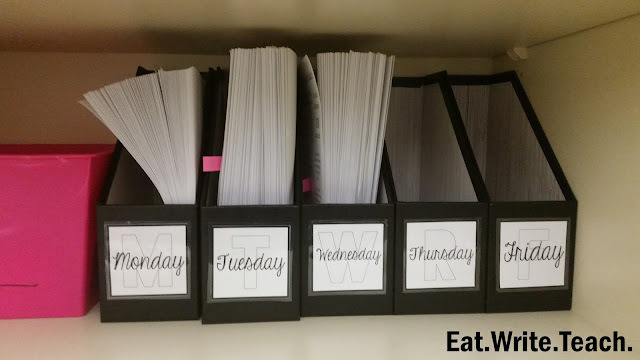 My Absent Binder and student supplies caddies sit on top of the shelves. I moved my homework turn-in spot and handouts drawers to this same area, and then each of those little bins are used to hold students' Smash Books (a first for me this year). Next to that is a cell phone charging station, inspired by The Teal Paperclip. 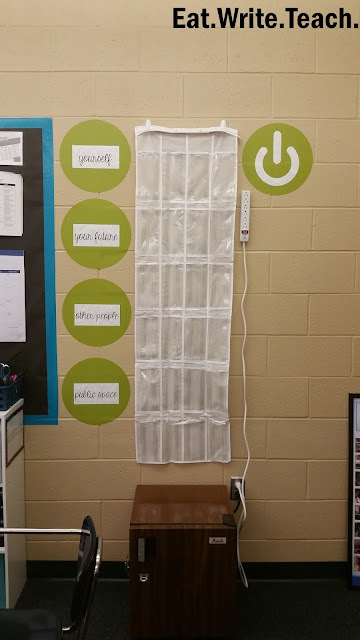 My students love having a designated location to charge their phones, and I love that their phones are over here and out of sight instead of burning a hole in their pockets! I added a paper book shelf for book recommendations, also inspired by The Teal Paperclip. I have an envelope of book spines, so after students read a book they would recommend, they can decorate a spine with the title and author's name and add it to our bookshelf. 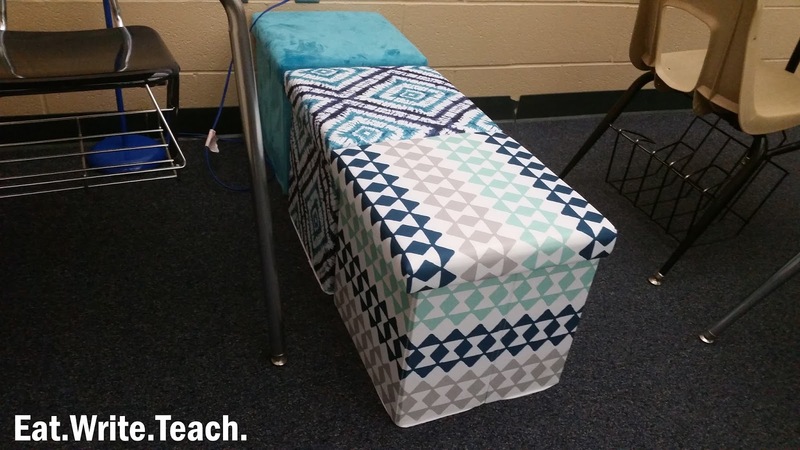 These are the storage ottomans I raved about in this post. They are so functional! They hold so much stuff and provide extra seating. Love them! 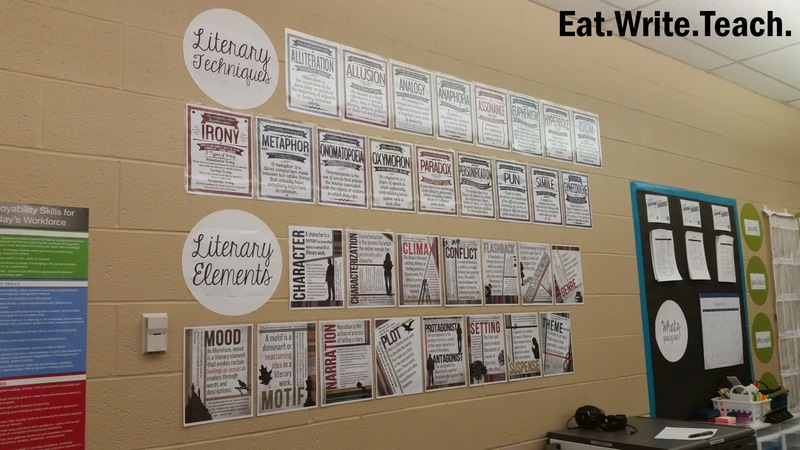 Those critical thinking posters are more Stacey Lloyd products. They really added a lot of flair to my room this year, and they are so useful! 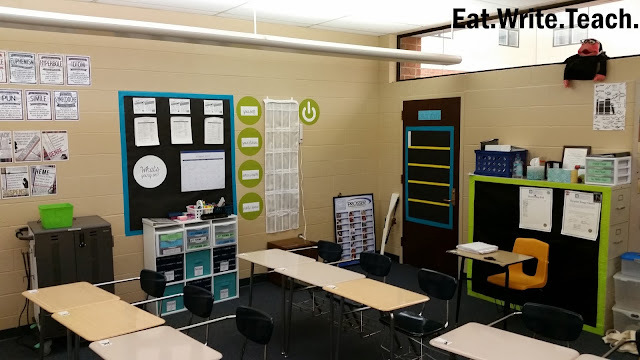 Fashionable and functional are big wins in this classroom. Check out those prints above my white board! Aren't they absolutely lovely? Those beauties came from Elegance and Enchantment. * Michelle designs these beautiful inspirational prints that you can download. I browsed through her Enchanting Mondays Library (she has a selection dedicated to the classroom) and I selected nine prints for my classroom (at least to start with). 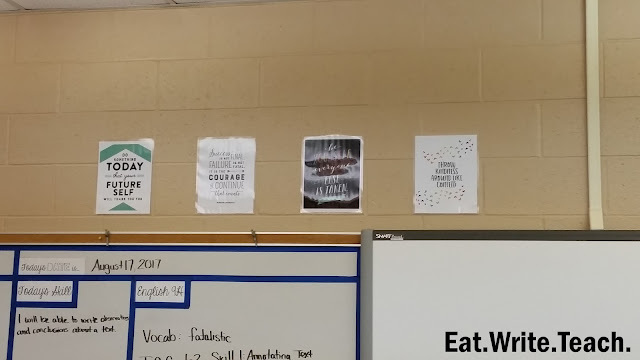 Eight of them are above my boards, right in student view, with my favorite one being above my light switch in my classroom. I love that when you download her prints, the download includes files of varying print sizes, and she offers advice for the best printing. 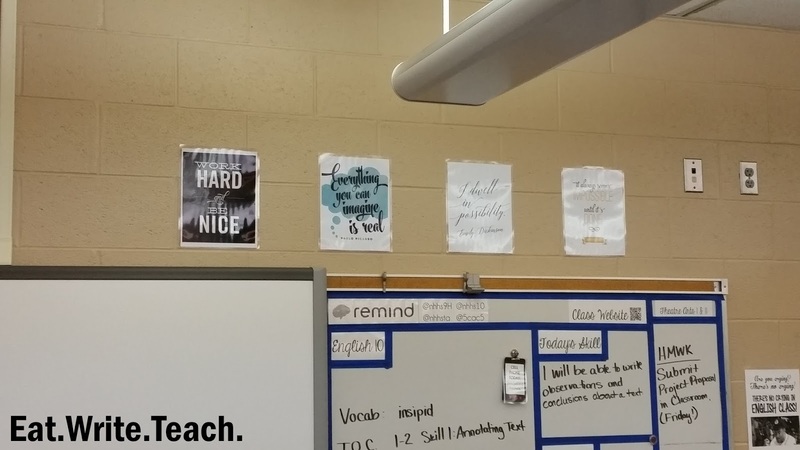 These prints are an awesome way to add a touch of design to a classroom, and I loved the messages I selected. I can also definitely see myself finding other designs, printing them, and hanging them in my home or giving them as gifts. 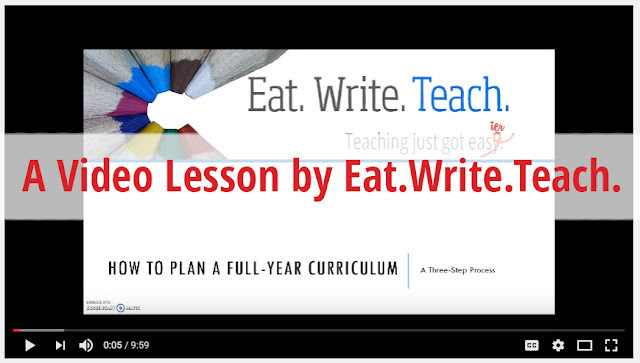 Michelle has set up a custom coupon code for Eat.Write.Teach. readers that will work through the end of the year and takes 10% off any level of membership! Just click here and use the code EATWRITE10. *Please note that I am an affiliate of Elegance and Enchantment, which means that I'll receive a commission if you click the above links and subscribe.